To maximize your solar energy output, clear the path between your panel array and the sun. The more free power your photovoltaic system creates, the more you save on monthly utility bills. And when you have optimal solar output, you will reach the payback point on your PV system faster. Removing obstacles that shade your property is one sure way to increase your solar energy production. Photovoltaic panels need sunlight to produce electricity. Any amount of shading — even partial shade — will reduce their energy output. If your PV system has a string inverter, the effect can be profound. String inverters convert power for all the photovoltaic modules in an array. So if shade covers even one solar panel, it will decrease the overall system production. Micro-inverters can provide a partial solution this problem, because each solar panel is connected to its own inverter. Consequently, shading on one won’t affect the energy output of the other photovoltaic modules. But you will still lose the power output of whatever panels are in the shade. Whenever possible, obstacles that create shade should be removed. Eliminating shade problems helps optimize solar energy production. Trees can add natural beauty to your landscape, but they can be a real problem for solar output. The easiest solution is to remove trees that shade your photovoltaic panels. Or, if you prefer to keep the trees, regularly trim away the offending branches. However, if the shade-causing trees aren’t on your property or you live in a community with a homeowners association, you can’t simply cut them down. Some neighbors and HOAs are reasonable, and will at least allow you to trim a branch or two. If yours aren’t, check into your state’s solar access and easement laws. Knowing your rights can help you make an effective argument for removing these obstacles to your photovoltaic production. Rooftop obstructions, such as chimneys and vents, can easily shade nearby photovoltaic panels. Since moving these obstacles isn’t usually practical, PV system placement must be carefully planned to avoid shading. With some rooftops, it is nearly impossible to avoid shading of your photovoltaic modules. In these cases, installing a ground-mounted PV system is a preferable route to optimal solar energy output. Ground-mounted photovoltaic modules can be installed in any sunny spot on your property. Since this type of PV system can be placed at the perfect tilt and orientation, maximum electricity production can be achieved. The experts at Intermountain Wind & Solar, serving Idaho, Utah, Nevada, Colorado and Wyoming, understand the challenges of shading and photovoltaic production. Our professional team can design and install an efficient PV system that works around any potential obstructions. Contact us today to learn how we can help you optimize your solar energy output. What is a hybrid solar energy system, and might it be the right option for you? Most homeowners who choose solar elect to install grid-tied photovoltaic arrays. A second option, although less common, involves going off-grid with a battery bank. Although you may not know it, you have a third option to consider, and it combines the best aspects of on- and off-grid solar. How Does Hybrid Solar Work? A hybrid solar power system gives you the best of both grid-tied and off-grid worlds. This type of PV system is connected to the utility grid, just like a standard grid-tied system, so you will always have power at night and on cloudy days. But a traditional grid-tied PV system will stop working if the power grid goes down. When a blackout occurs, the photovoltaic system is programmed to automatically shut off for safety reasons. This allows utility workers to safely make repairs without power in the lines. Hybrid systems solve this problem with the addition of a solar battery bank, and in some cases, a backup generator. 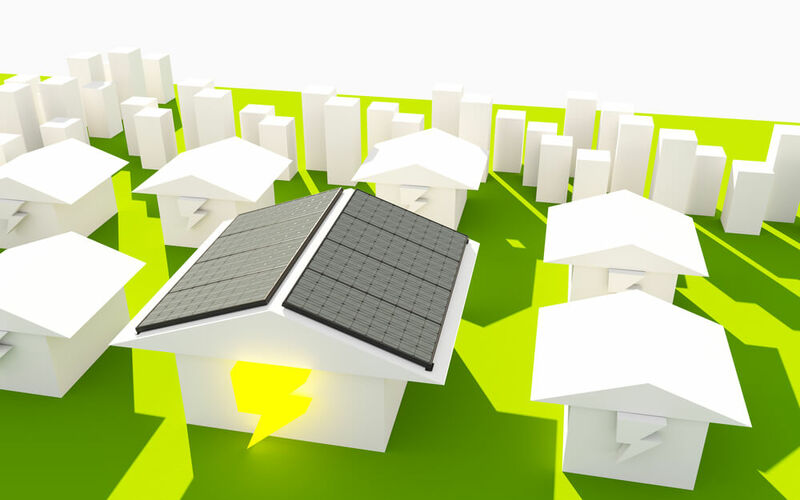 Why Should You Consider a Hybrid PV System? Blackouts are on the rise, and the Intermountain West could be affected at any time. If the grid has a significant problem, you could be in the dark for days — or longer. Installing a hybrid solar power system is a great way to prepare for any unexpected event. If a severe storm or natural disaster strikes your area, you won’t be left without electricity — unlike most of your neighbors. Which Type of Hybrid Solar Power System Is Best? Hybrid systems are not one-size-fits-all. They come in a range of sizes and configurations to meet your specific home energy needs. Smaller, less expensive systems can keep your home powered up during short blackouts. For power outages that last longer, small hybrid systems will provide enough electricity for a day or two, as long as you limit your consumption to running only the most critical appliances. If you want to make sure that your entire home has power no matter how long an outage lasts, you’ll need more solar panels and a larger battery bank. The best type of hybrid system is one that is designed to meet your needs and objectives. Consulting with a professional photovoltaic contractor is the easiest way to determine the ideal size and configuration of your home solar energy system. The professional team at Intermountain Wind & Solar offers free photovoltaic energy consultations to homeowners and businesses throughout Idaho, Utah, Colorado, Wyoming and Nevada. Contact us today to learn more and to determine if a hybrid solar energy system is right for you. Some financial experts say the solar ROI (return on investment) is often better than the stock market. Photovoltaic power undoubtedly comes with impressive returns. And in fact, many homeowners reach the payback point on their photovoltaic systems in well under a decade. A home PV system is already a lucrative investment, one that offers increasingly high returns as time goes on. But with a little extra effort, you can boost your solar ROI even more. Reduce your electricity consumption, and you’ll reduce the number of solar panels required to meet your power needs. Your costs for switching to photovoltaic power will be less, so your home PV system will pay off much more quickly. Taking energy efficiency measures to improve your solar ROI doesn’t have to be a hassle. Even taking simple steps like swapping out your incandescent bulbs, using power strips for your electronics and installing a smart thermostat can noticeably decrease your energy use. Bringing down your photovoltaic investment costs is key to maximizing your solar ROI. Fortunately, when you install a home PV system, you are eligible for a number of rewarding financial incentives. The federal solar tax credit takes 30 percent off the top of your photovoltaic expenses — you’ll get that back when you file your income taxes. State and local tax credits, rebates and grants sweeten the deal, saving you thousands more. Claim every possible financial incentive, and you can slash your total photovoltaic costs by as much as 50 percent. No question, this will boost your solar ROI. Hiring a handyman to mount your solar panels might cut some on the upfront costs of photovoltaic power. However, it isn’t likely to lead to an improved solar ROI. Hiring an experienced, professional photovoltaic contractor ensures that your home PV power system will provide decades of trouble-free operation, complete with manufacturer’s equipment warranties. If you cut corners with your photovoltaic equipment or installation, you’re likely to be plagued with problems. For the highest investment returns, work with a licensed, professional contractor with a solid reputation — Intermountain Wind & Solar. Photovoltaic power is a long-term investment. This means that buying your PV system from Craigslist or off the back of somebody’s truck is not a good idea. High-quality solar panels, inverters and other home PV system components last longer than cheaper components. In fact, they often continue to function efficiently for years (or decades) beyond their warranties. So while you may pay a little more for quality photovoltaic components, the investment will pay off in the future. If you live in Utah, Idaho, Colorado, Wyoming or Nevada and you’re thinking about making the switch to photovoltaic power, contact Intermountain Wind & Solar today. Give us a call to schedule a free home PV consultation, and our team will be happy to answer all of your questions about solar ROI. Home solar energy installation has never been more affordable, as equipment costs have fallen dramatically over the last several years. But if you’re diligent about leveraging all the financial opportunities available to you, you can ensure that your photovoltaic system is even more affordable. The federal solar investment tax credit (ITC) offers the biggest single opportunity for reducing the cost of your home solar installation. With this lucrative financial incentive, you’ll get back a full 30 percent of your total photovoltaic costs in the form of a credit toward your income tax liability. If your home solar panel system costs $21,000, for example, you’ll be eligible for a $7,000 tax credit. If you don’t owe taxes this year, don’t worry. You can carry the remainder of your tax credit over to next year. To take advantage of this 30 percent savings, schedule your photovoltaic system installation soon. The federal solar tax credit will be reduced to 26 percent in 2020, then it drops to 22 percent in 2021. After that, it disappears. The federal tax credit can make a huge dent in your home solar power system costs. But claiming it isn’t the only way to reduce your system costs. State and local tax credits, rebates and grants for photovoltaic power installations can add up to thousands more in savings. Ask your photovoltaic contractor about the offers in your area. You can also check the comprehensive listings at the Database of State Incentives for Renewables and Efficiency (DSIRE) website, a free service provided by the U.S. Department of Energy. Also check with your local power company, as some offer rebates and incentives for power-saving home improvement projects. Leasing may sound like a good idea, since no down payment is required. But if you go that route for solar installation, you won’t own the solar panels and equipment (the leasing company retains ownership). Consequently, you will not be eligible for the federal tax credit or any financial incentives from your state or local government. A solar loan is a smarter way to finance your new photovoltaic system. And depending on the details of your system, you should be able to find a variety of loan programs that require little or no money down. If you have equity in your home and a favorable debt-to-income ratio, you could also consider a secured loan. Home equity loans and lines of credit, FHA loans and PACE loans offer favorable terms with low interest rates — and the interest is tax-deductible. If a secured loan doesn’t work for you, consider an unsecured solar loan. The interest rate may be slightly higher, but you can have approval in minutes. Explore your options online, or check with your photovoltaic contractor. To make it easy for our customers, Intermountain Wind & Solar offers residential solar installation financing. Would you like more tips on how to cut the costs of a photovoltaic system? Intermountain Wind & Solar offers free consultations to homeowners throughout Utah, Idaho, Wyoming, Colorado and Nevada. Contact us today to discover all the available incentives for home solar installation. For most homeowners, rooftop solar panels provide an efficient and cost-effective way to generate photovoltaic power. However, a rooftop PV panel installation isn’t always practical or even possible. Some roofs get too much shade, while others aren’t structurally suited for mounting a photovoltaic system. And in some cases, homeowners associations restrict or prohibit rooftop panel placement. Fortunately, you have other options that may better suit your needs. If the roof of your house won’t accommodate a PV installation, or if your unreasonably strict HOA won’t allow it, consider using other structures on your property. Sheds, barns, garages, patio covers and carports all provide alternatives to traditional home rooftop panel placement. If these structures are exposed to the sun for most of the day, they may be well-suited for photovoltaic power production. If you don’t have a viable alternate roof space for your PV system, you could build a shed or guest house, or install a carport or patio cover. Adding an alternative structure makes sense if you were already thinking about investing in one. But if you don’t have the need, the added expense probably doesn’t seem all that attractive. In that case, a ground-mounted solar array may make sense for you. A ground-mounted system is usually just as cost-effective as a rooftop PV system. Photovoltaic panels placed at ground level are highly efficient, since they can be installed at the ideal angle and orientation for maximum solar electricity output. What if you’re a renter? If you don’t own your home, installing rooftop solar panels probably isn’t an option you can or even should consider. But that doesn’t mean you can’t save money with photovoltaic power. Mobile solar power systems don’t have to be attached to a house or other structure, and using one for home power won’t damage the property. With portable or mobile solar, your landlord has no reason to object. Many portable photovoltaic options are available. For home appliances, electronics and lighting, you can choose a large mobile solar unit, perhaps one with batteries for energy storage and a generator for backup power. To use your setup, simply place the PV system in a sunny spot in the yard or driveway. If necessary, you can easily move the mobile solar unit to another location to capture more sunlight. Best of all, a portable photovoltaic system can go wherever you go. Take it on your travels for a free source of electricity, and when you decide to move, just pack it up and bring it along. Intermountain Wind & Solar, the leading photovoltaic contractor in Utah, Idaho, Nevada, Colorado and Wyoming, can help you explore your PV installation options. If you suspect you can’t install a panel array on your roof, contact us today to schedule a free consultation to learn about the alternatives to rooftop solar. Switching to photovoltaic power was once the purview of the wealthy — out of reach for most Americans. Fortunately, that is no longer the case. The price of adopting solar has plummeted over the last few decades, and getting financing has become much simpler. A range of federal, state and local solar tax credits, rebates and grants sweeten the pot, bringing down photovoltaic investment costs. Combined, these factors have driven explosive growth in the residential solar sector. A study comparing household income to photovoltaic adoption found that the average income of solar adopters has dropped by over $21,000 since the early 2000s. Another recent study revealed that most photovoltaic system installations are in middle-class neighborhoods, on homes whose owners have annual incomes of between $40,000 and $90,000. Environmental reasons were once the driving cause for most early adopters. When people with financial means wanted to “go green,” they installed home solar energy systems. Today, many solar adopters are eco-conscious, but that’s not why most choose to invest in photovoltaic energy. The real reason is that adopting solar has become an economic decision, driven by the potential of huge cost savings. Simply put, people began to realize the savings that are achievable with photovoltaic power. Creating free electricity from sunlight means paying much less — or even nothing — to the utility company. Over the course of a year, this adds up to hundreds or even thousands of dollars in savings for most homeowners. And the savings don’t stop there. Utility rates have been on the rise for decades, a trend that will surely continue. Installing a photovoltaic system offers freedom from the ever-increasing costs of grid electricity. For many finance-minded Americans, this energy independence is priceless, and well worth the modest expense of going solar. Homeowners also see that installing a solar energy system boosts home value. Regardless of whether they plan to sell their home in the near future, investing in upgrades that increase your home’s value make sense, especially if you’re saving money at the same time. Would you like to learn how affordable it can be to install solar energy at your home? Schedule a free consultation with the professionals at Intermountain Wind & Solar, serving Utah, Idaho, Nevada, Colorado and Wyoming. Contact us today for answers to all of your questions about switching to photovoltaic power. When you install a solar power system, your professional photovoltaic contractor will handle just about everything for you. You will, however, have to make three important decisions. No. 1: Grid-Tied or Off-Grid Solar Power? Most home photovoltaic arrays in the Intermountain West remain connected to the municipal power grid. A grid-tied home PV system makes sense if you want the financial savings and benefits of going solar and the security of having access to utility power whenever you need it. With a grid-tied photovoltaic system, your solar panels create electricity when the sun shines, and the grid provides energy when it doesn’t. But if you’re looking to cut ties with the utility company, off-grid solar power is for you. You will, however, need extra equipment to power your home at night and during inclement weather, so expect your photovoltaic costs to be slightly higher. No. 2: Rooftop or Ground-Mounted Solar Power? Most homeowners opt to install rooftop solar energy systems. The roof is often the best place for a photovoltaic array, and the streamlined appearance is aesthetically pleasing. Rooftop solar power systems are cost-effective and efficient, but this option isn’t right for everyone. Roofs with space limitations, shading or obstructions aren’t well-suited for a home PV array. And aging or damaged roofs may be unable to handle the extra weight and stress without repairs — an added cost some homeowners aren’t prepared to pay. If your roof situation doesn’t allow for solar panels, you may prefer a ground-mounted photovoltaic array. A home PV system can work effectively in any sunny spot on your property. A ground-mounted solar energy system be installed at the perfect tilt and orientation to capture the maximum amount of sunlight. No. 3: Lease or Buy Your Solar Power System? Homeowners are often tempted to choose a solar lease, since some plans require no money down. However, purchasing a photovoltaic array is a smarter financial decision for almost everyone. Go with a lease, and you won’t be eligible for the many lucrative financial incentives for going solar. Because the leasing company will own your home PV system, they get to claim the federal solar tax credit as well as any state or local tax credits, grants and rebates. Leasing also locks you into a contract, typically for 15 to 20 years. If you decide to sell your home, you may have trouble finding a buyer with the willingness (and credit score) to take on the lease. If you don’t have cash to pay for a photovoltaic array installation, don’t worry. Many financing options are available today, and some plans require little or no money down. The professionals at Intermountain Wind & Solar, the region’s leading photovoltaic provider, can explain all your financing options and offer advice on other important home PV project decisions. Contact us to schedule a free solar power consultation today. If installing a home PV system hasn’t made it to the top of your to-do list, a little more research may be in order. Solar energy is gaining popularity among homeowners across the Intermountain West. This is no surprise when you consider the many advantages that come with a photovoltaic installation. As soon as you flip the switch to bring your home PV installation online, your solar panels will begin to create electricity. You might not notice them working, but you’ll see the results on your next utility bill. The amount you’ll need to pay the power company will be less than your usual bill — much less for many of our customers. Other customers never pay another power bill after going solar. And you’ll see these same savings every month. Take a look at your past few years’ power bills for proof that the cost of grid power has been steadily increasing. And rates will continue to rise as time goes on. The average residential electricity rate in 2003 was about 8 cents per kilowatt hour (kWh). In 2016, the average rate was 12.54 cents per kWh. This year, rates are already up to 12.95 cents per kWh. When you install a home PV system, you lock in low, predictable energy costs. As the utility rates go up each year, your solar savings grow accordingly. Regardless of whether your home PV system is connected to the utility grid for backup power, creating your own solar electricity gives you the satisfaction of energy independence. Reducing your reliance on the utility company gives you the peace of mind of knowing that you aren’t at the mercy of their ever-increasing rates and charges. And if you add a battery storage system to your photovoltaic installation, you may be able to ditch the grid and move toward full energy independence. Chances are, you may not live in your home forever. If you decide to sell, you won’t want to wait long for a good offer. Installing a home PV system will make your property stand out among the competing listings. Solar-powered homes sell much faster than similar homes without photovoltaic systems, and they often sell for a higher price. A recent study conducted by the U.S. Department of Energy and the Lawrence Berkeley National Laboratory shows that home buyers pay, on average, $15,000 more for homes with photovoltaic systems. Photovoltaic panel prices are at record lows, and lucrative financial incentives have made home PV much more affordable. With the wide range of budget-friendly financing options, going solar has never been easier. Home solar power is now within everyone’s reach. Personal, expert assistance from a professional photovoltaic contractor makes converting to solar electricity a simple, hassle-free endeavor. This home-improvement project won’t take much of your time or attention, and you’ll enjoy savings for decades. If you’re ready to make the switch, the professional team at Intermountain Wind & Solar, the region’s leading solar contractor, offers complimentary consultations to homeowners throughout Idaho, Wyoming, Utah, Colorado and Nevada. Contact us today to schedule your home PV system consultation. Can You Trust Online Solar Calculators? Online solar calculators are everywhere these days. In fact, it seems like nearly every website related to photovoltaic energy has its own now. Simply type in some basic information, and these tools offer size recommendations and some type of cost estimate for purchasing a PV solar energy system. But can you really rely on an online calculator to plan your photovoltaic installation? In some cases you can, but it’s important to understand the limitations inherent in these seemingly convenient tools. If you use an accurate solar calculator, you’ll get information that can be helpful in planning your switch to photovoltaic power. Mapdwell, an online tool created by the Massachusetts Institute of Technology (MIT), and Google’s Project Sunroof both use advanced, high-resolution imagery to provide more precise results. However, neither of these calculators covers the entire Intermountain West. PVWatts, developed by the National Renewable Energy Laboratory (NREL), offers detailed and reliable estimates for home PV systems. In fact, the solar power calculator here on the Intermountain Wind & Solar website uses data from PVWatts. You can trust the results from online tools like Mapdwell, Project Sunroof, PVWatts and our own solar power calculator, but they aren’t intended to be used as your only source of information. Planning a home PV system based only on the data they provide can’t give you the whole story. Online calculators use state-of-the-art, precise technology — but their results are only accurate if you’re accurate. Without a thorough understanding of how photovoltaic power works, you might misunderstand some of the terms and enter incorrect information. Even one simple error could skew your results. Plus, solar power calculators may not factor financial incentives like tax credits, rebates and grants into the total. Finally, like any type of computer-generated information, the results you get from a solar calculator lack invaluable human analysis and input. Using online tools can give you a general understanding of your home’s solar potential and a rough idea of system cost. However, planning the design and installation of a photovoltaic power system is best left to the professionals. Professional solar contractors have the knowledge and experience to calculate the optimal size, configuration and placement of a home PV system. And by conducting an in-person analysis of your rooftop and property, a contractor will be able to factor in details that online solar calculators might miss. Finally, a local professional contractor knows about all the financial incentives and financing options applicable to your location in the Intermountain West. And with an individual consultation, you’ll have the chance to ask all your questions about making the switch to photovoltaic power. We recommend that you check out the online tools for a preliminary home PV estimate, then schedule a free consultation with the professional contractors at Intermountain Wind & Solar, the leading photovoltaic provider in Idaho, Utah, Colorado, Wyoming and Nevada. Don’t invest in a home PV system based on the advice of an online solar calculator alone. Let us help you plan the ideal photovoltaic array to meet your energy needs.